Named after the Danish word for "grace," this classic round watch embodies understated elegance with a modern aesthetic. A clean, minimalist dial with crystal indexes pairs with a slender mesh strap to elevate the overall grace of the striking timepiece. 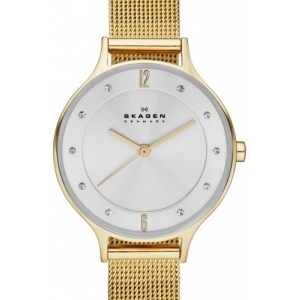 Style Name:Skagen 'Anita' Crystal Index Mesh Strap Watch, 30Mm. Style Number: 936001. Available in stores.